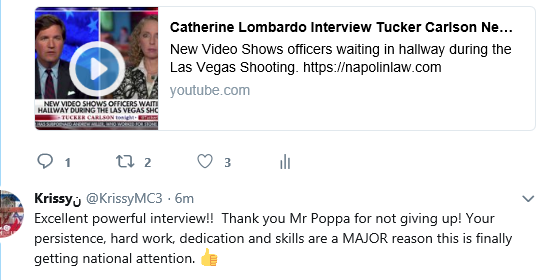 Lombardo (no relation to Clark County Sheriff Joe Lombardo) is a former prosecutor and police commissioner who is representing several Californians who were victims of the Las Vegas mass shooting. The Baltimore Post-Examiner was the first to report on the cowardly acts of Hendrex and security officers as well as the coverup of what really happened in the worst mass shooting in modern history of the United States that left dozens dead and more than 400 injured. Hendrex, along with Officer Elif Varsin, his trainee and three armed Mandalay Bay security managers were too scared to confront Paddock. They remained on the 31st floor of the hotel listening to the gunfire for several minutes that was originating from the 32nd floor as Hendrex’s and Varsin’s police radios broadcast the horror occurring at the concert venue. 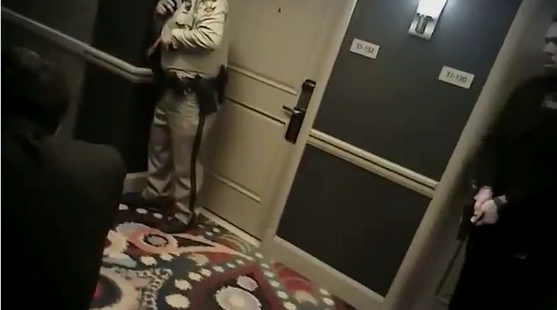 It was not until the gunfire stopped that the armed contingent entered the stairwell where they remained for over 30 minutes until the arrival of other officers. On February 14 of this year, 17 persons were killed, and over a dozen others injured when gunman Nikolas Cruz opened fire at Marjory Stoneman Douglas High School in Parkland, Florida. A Broward County Deputy Sheriff, Scot Peterson, remained outside the building as the shots were being fired and failed to confront the gunman. Peterson, who was called a coward, was suspended without pay the following day but he immediately retired. “I have a client whose spouse was shot and killed inside the venue during the 12thand final burst of gunfire,” Lombardo said.